In epoxy primer last week. My good friend has countless hours in the Montes body. Nice ... progress is looking good! Thanks guys, a lot of time and money to do the Monte right. Three coats of Chrome-Z sprayable filler will go on this week. 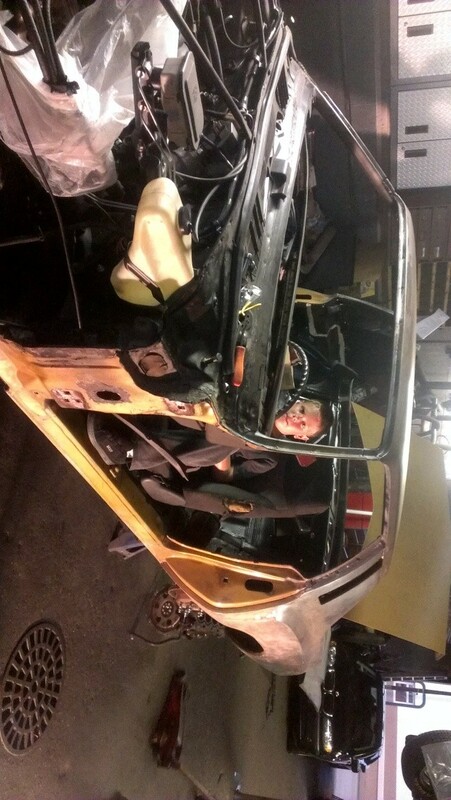 Doors, fenders, trunk lid and core support are all at the acid dipper in Franklin, WI. Then off to be dipped in epoxy in MI. I should have the dipped panels back in about 4 weeks. One gallon of Chrome-Z sprayable filler. Sweet ... bet you are looking forward to having all this done so you can get it on the road again! 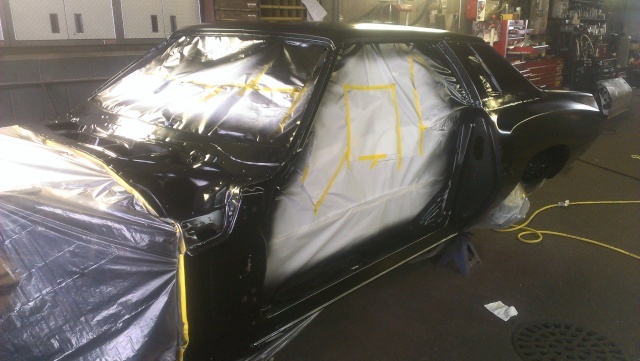 knightfan26917 wrote: Sweet ... bet you are looking forward to having all this done so you can get it on the road again! Yes, I put 2500 miles on the Monte summer '13 and have not driven the car in 20 months. I could have left the car alone but too much rust was falling out of the headliner and could never have it out in the rain. Still having a tough time picking a color. Going to paint supplier today to talk about options. That Rust Defender is great stuff, it levels really well. 73CopperMonte wrote: Yes, I put 2500 miles on the Monte summer '13 and have not driven the car in 20 months. So, how'd that go? Narrow down your choices at all? Good that you went ahead & did this now ... you'll be able to enjoy it a lot more once it is ready to go! I feel the pain about not driving...! Looking for paint is a PITA. Not much help from a couple local paint suppliers. No one wants to adjust the original color and they all say the color is hit or miss. 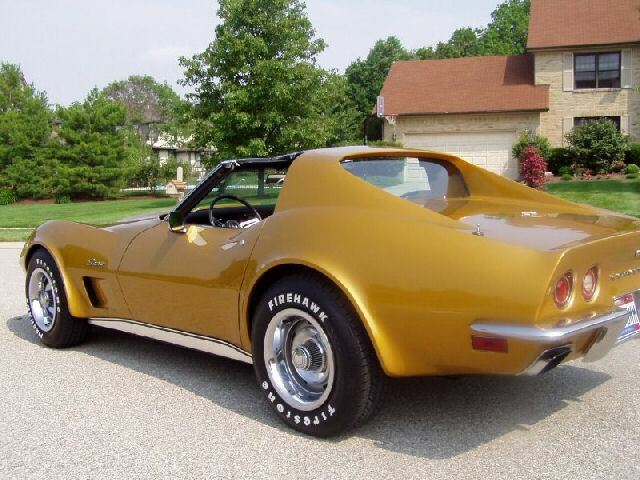 I think 1973 Corvette Metallic Yellow is the color but every 73 Vette in that color looks a different shade of gold. Terrace in Addison quoted me $507 for a gallon of Dupont Chromabase. Other quotes, $750-780 gallon for quality PPG from other suppliers. $507 a gallon for DuPont is still pricey, not as crazy as the PPG stuff though. What clear were you planning on using? 73CopperMonte wrote: Looking for paint is a PITA. Not much help from a couple local paint suppliers. No one wants to adjust the original color and they all say the color is hit or miss. Ouch ... kinda glad I'm not looking for & choosing paint. Sorry you aren't having too much luck with it. Have they said why they don't want to adjust the color? Their quality is amazing. They have forum where you can read for hours from guys using their stuff. Their clear is high solids has been used on super high end restorations and cars that have sold for over 6 digits at auction. And their price for clear cant be beat. $113 a gallon and the activator is $37.55. The results and quality of their epoxy is great. And at $91 a gallon, thats great. Here's the thread about it and the video is in the first response by Barry. And customer service, what company can you call ANYTIME, day or night or weekends and speak with someone? Including the owner. They are always available to answer questions about compatibility and proper usage. They only make a few basic colors of basecoat. SPI products can be used over ANY brand of basecoat. Their reducers and activators can be used with any manufacturers products. So since SPI doesnt make custom mixed basecoat colors you have to go with a company your comfortable with. All the major manufacturers make high end an low end products which would all be fine. But the higher end you go the more quality you get especially with coverage. A lower end might need 4 coats to get good coverage when a higher end might only need 2 coats. DEPENDING ON COLOR CHOICE. Some colors cover better than others. And "red" color are usually the most expensive. So I'd spend a little more and get a quality base for several reasons. Especially less coats. Less coats is less paint (cheaper), less coats is less chance for a mistake and less coats is less time. On the SPI forum there are always guys asking about the quality and price differences of different brands of basecoat. From what I've read a good quality, mid priced basecoat can be had from Pro-Spray (sikkens brand), Wanda or Mettalux. I've heard that the Mettalux line might be getting discontinued but I've found it locally by me. I opted for Pro-Spray. 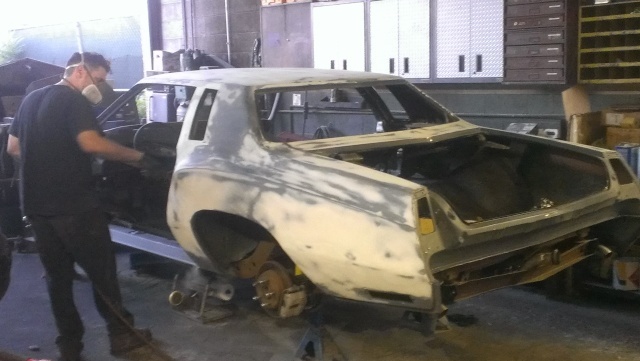 I priced it locally and it was very reasonable but ended up getting it from http://www.autorodtechnologies.com/ Chad is the owner of this high end restoration company. His shipped prices are better than my jobber locally. And he does custom mixing of any color required. I've shot 3 different batches of custom mixed Pro-Spray blue metallic and the stuff laid out smooth and covered in 2 coats. I couldnt ask for more. The custom mixed Bright Blue Metallic gallon price was around $354 shipped. I purchased 2 gallons of the blue and 2 quarts of Argent Silver for about $870 if I remember correctly. More than enough to spray my chevelle, stripe her,and shoot my stock rims. I think there's some great savings to be had if you research it. I just cant get over the SPI products. I've been on their forum for over a year reading about their clears and epoxies. But check out the video about their epoxy. And I forgot to mention, SPI EPOXY has a 7 DAY WINDOW to topcoat with NO SANDING. I'll check it out too, always interested in what other people are using. I'm running into a paint compatabilty issue on my wife's car. Trying to go with a less expensive base and turn it into a tri coat. I already have the mid coat, from RM which is polyester based and not compatable with the Omni base color I've decided on. $36 a quart for black metallic pearl. Will have to stop at our paint supplier and see what my options are. That's a huge benefit is the customer service and ability to have questions answered and solutions made when issues arise. 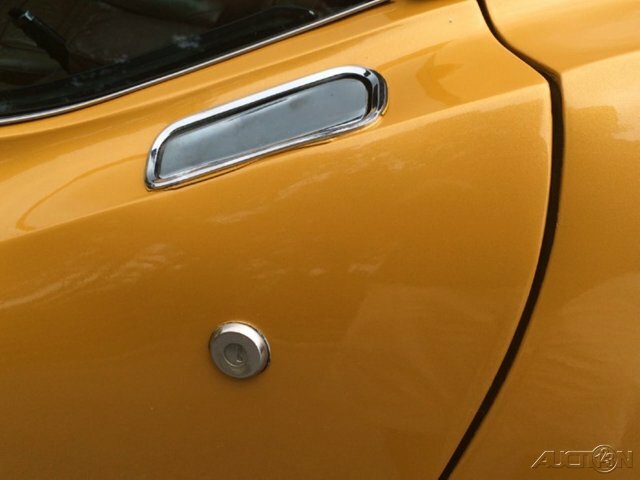 Custom colors and custom paintwork always presents issues. Thanks for the info guys. SPI epoxy went on the car first. I am going to use SPI clear over the base. THATS AN AWESOME COLOR !!!! Great choice. If they adjust the color then they are responsible for the gallon of paint if it goes wrong. Every supplier I talked to will only mix to the code because they have no idea how to adjust the color to what I want. I would like the original color but with less orange in it. I might get a 1/2 pint of the Metallic Yellow to do a test spray. Joe73 wrote: THATS AN AWESOME COLOR !!!! Great choice. 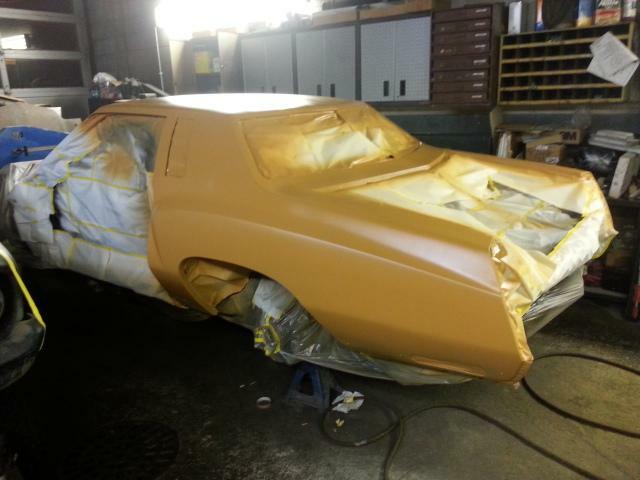 Thanks Joe, I think it will be different, cant find another car painted that color except 73 Vettes. I have a 73 chevy ppg color chart for all models. The bottom of the chart has a bunch of "corvette" only colors. Thats probably why. 73CopperMonte wrote: If they adjust the color then they are responsible for the gallon of paint if it goes wrong. Every supplier I talked to will only mix to the code because they have no idea how to adjust the color to what I want. Good idea to do a test spray. Yeah, I don't blame 'em for not wanting to do those adjustments since they'd be responsible. I do love that color on that Corvette you posted earlier.